Bangladesh SW-872:BU-10 - Knitted Cable Design. Sleeveless Sweater Vest. Boy's sweater vest, pullover, knitted Cable Design, V-Neck, 100% Cotton 100% cotton. Machine Wash. Pullover. 7BS005 - Age: for 2-12 years. High quality 100% cotton fabric material is soft and warm, good elastic that fit your body easily. V-neck, classic cable knits, simple stripe design, and solid color keep you a gentle style. Suggest one size larger ★ Color: Navy/Black/Light Blue/Red/White. After cleaning, please adjust the clothes pattern for airing.
. Sleeveless sweater vest, easy to wear on and take off. Our products are beautifully packaged and they can be great gift choice for your family kids and friends. The product is both hand and machine washable, hand wash recommended. There might be slight color deviation due to different displays. 2. Do not use bleach and soak for a long time. Benito & Benita Sweater Vest School Vest V-Neck Uniforms Cotton Cable-Knit Pullover for Boys/Girls 2-12Y - The quality of our products is strictly controlled, so you can trust the quality of us. Warranty:we are committed to give customers a best shopping experience. Notice: 1. Size: please see our size table and choose the suitable size. So, if you have any question or problems please free to contact us, we will do our best to help and resolve it. Size measurements table:size 98 2-3 Year : Front Length - 15. Bangladesh SW-871 - Pullover. Sleeveless Sweater Vest. Knit ribbed hem is not easy to deform. Easy to fit different type of outfit and shirt. Sleeveless sweater vest, easy to wear on and take off. Age: for 2-12 years. High quality 100% cotton fabric material is soft and warm, good elastic that fit your body easily. V-neck, simple stripe design, classic cable knits, and solid color keep you a gentle style.
. Suggest one size larger ★ Color: Navy/Black/Light Blue/Red/White. Knitted Solid Design. Machine Wash. Suitable for daily wear, perfect fits as the school uniform. Boy's sweater vest, v-neck, pullover, knitted, 100% Cotton Size: please see our size table and choose the suitable size. Best wear in spring, autumn and winter. 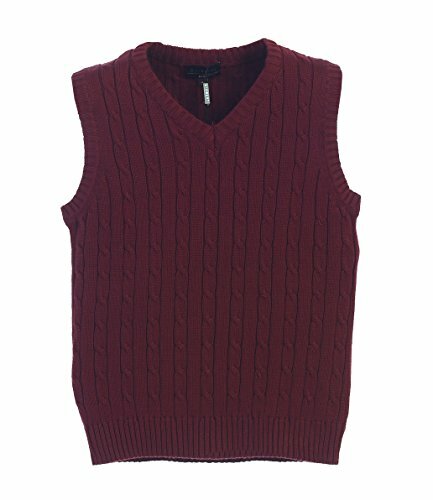 Gioberti Boy's V-Neck Knitted Pullover Sweater Vest - Our products are beautifully packaged and they can be great gift choice for your family kids and friends. The product is both hand and machine washable, hand wash recommended. 100% cotton. Benito & Benita - Pullover. Sleeveless sweater vest, easy to wear on and take off. The measurement may have 1-3cm 039-1. 18inch inaccurate deviation. Great for daily wear or any other occasion. Popular and warm enough that suitable for Spring, Autumn and Winter. The product is both hand and machine washable, or concerns, hand wash recommended. Notice: 1. There might be slight color deviation due to different displays. Sleeveless sweater vest, easy to wear on and take off. Suggest one size larger★ Color: Grey/Navy/Black/Light Blue. Suitable for daily wear, perfect fits as the school uniform. Four popular colors to choose. Sleeveless Sweater Vest. Anti-pilling and not easy to deform. Benito & Benita Boys' Sweater Vest School V-Neck Uniforms Cotton Cable Knit Pullover Sweaters for Boys/Girls 3-12Y - Suggest one size larger ★ Color: Navy/Black/Light Blue/Red/White. Age: for 3-12 years. High quality 100% cotton material, soft knit fabric for warm and cozy fit, good elastic that fit your body easily. High quality knit ribbed hem is stretchy and easy to wear. Best wear in spring, autumn and winter. - Whether it's our all-season staple of solid color cable knit, or our more playful argyle intarsia pattern, this piece will be the perfect layering piece for your guy. Great for daily wear or any other occasion. Popular and warm enough that suitable for Spring, Autumn and Winter. The product is both hand and machine washable, or concerns, hand wash recommended. Features an argyle pattern down the center front and rib trim at the sleeves, collar, and hem. Solid: cable knit on both front and back, collar, and rib trim at the sleeves, and hem. Machine washable. Suggest one size larger ★ Color: Navy/Black/Light Blue/Red/White. Argyle: timeless argyle in perfect spring colorways define the look of this plush cotton V-neck sweater vest. Hope & Henry Boys V-Neck Sweater Vest - Suggest one size larger★ Color: Grey/Navy/Black/Light Blue. Knitted Solid Design. Our classic v-neck sweater vest silhouette is knit in super soft cotton for the ultimate in comfort and style. Best wear in spring, autumn and winter. Layer over one of our incredible cotton button down shirts for the complete look! Size: please see our size table and choose the suitable size. Knit ribbed hem is not easy to deform. Classroom 56912 - Age: for 2-12 years. High quality 100% cotton fabric material is soft and warm, good elastic that fit your body easily. V-neck, simple stripe design, classic cable knits, and solid color keep you a gentle style. Layer over one of our incredible cotton button down shirts for the complete look! Whether it's our all-season staple of solid color cable knit, or our more playful argyle intarsia pattern, this piece will be the perfect layering piece for your guy. Machine Wash. Knitted Solid Design. Knit ribbed hem is not easy to deform. Our unisex sweater vest are beautifully packaged and can be best festive gift for your boys and girls. Knit ribbed hem is not easy to deform. Easy to fit different type of outfit and shirt. Sleeveless sweater vest, easy to wear on and take off. CLASSROOM Boys' Uniform Sweater Vest - Suggest one size larger★ Color: Grey/Navy/Black/Light Blue. Features an argyle pattern down the center front and rib trim at the sleeves, collar, and hem. Solid: cable knit on both front and back, and rib trim at the sleeves, collar, and hem. Machine washable. V-neck. H1-ZZTQ-Q1NA - If you need any additional information regarding this item feel free to contact us, we'd be glad to respond any question you may have. Suggest one size larger ★ Color: Navy/Black/Light Blue/Red/White. Pullover. Great for daily wear or any other occasion. Popular and warm enough that suitable for Spring, Autumn and Winter. The product is both hand and machine washable, or concerns, hand wash recommended. Features an argyle pattern down the center front and rib trim at the sleeves, collar, and hem. Solid: cable knit on both front and back, and rib trim at the sleeves, collar, and hem. Machine washable. V-neck. Machine Wash. Pullover. Blue Ocean Kids Argyle Sweater Vest - Suitable for daily wear, perfect fits as the school uniform. Argyle: timeless argyle in perfect spring colorways define the look of this plush cotton V-neck sweater vest. Age: for 2-12 years. High quality 100% cotton fabric material is soft and warm, good elastic that fit your body easily. V-neck, classic cable knits, simple stripe design, and solid color keep you a gentle style. 07"--bust29. 91"--hem 22. 03"--shoulder12. 59" size 146 10-11 years-- Front Length21. 06"--bust31. 09"--hem 23. 21"--shoulder13. 18" size 152 11-12 years-- Front Length22. 04"--bust32. 27"--hem24. 39"--shoulder13. 77" size 158 12-13 years-- Front Length22. 85"--bust33. 45"--hem 25. 57"--shoulder14. Bangladesh SW-891 - Imported. Please, see "product description" below for size measuremENT INFORMATION. 50% cotton; 42% polyester; 8% Wool. Size:please check our size measurements in Product Description section. Lightweight Knitted Construction. No pill and easy care. V- neck, classic cable knits, simple stripe design. Sleeveless Sweater Vest. Suggest one size larger★ Color: Grey/Navy/Black/Light Blue. Pullover. Suggest one size larger ★ Color: Navy/Black/Light Blue/Red/White. Knit ribbed hem is not easy to deform. Our unisex sweater vest are beautifully packaged and can be best festive gift for your boys and girls. Features an argyle pattern down the center front and rib trim at the sleeves, collar, and hem. Gioberti Boy's Knitted Full Zip 100% Cotton Cardigan Sweater - Solid: cable knit on both front and back, and rib trim at the sleeves, collar, and hem. Machine washable. V-neck. Argyle: timeless argyle in perfect spring colorways define the look of this plush cotton V-neck sweater vest. Whether it's our all-season staple of solid color cable knit, or our more playful argyle intarsia pattern, this piece will be the perfect layering piece for your guy. Size: please see our size table and choose the suitable size. French Toast Uniforms Children's Apparel SC9016 - Age: for 3-12 years. High quality 100% cotton material, soft knit fabric for warm and cozy fit, good elastic that fit your body easily. Our products are beautifully packaged and they can be great gift choice for your family kids and friends. The product is both hand and machine washable, hand wash recommended. Sleeveless sweater vest, easy to wear on and take off. 2x2 ribbing At Cuffs & Neck. Anti-Pilling. Lightweight Knitted Construction. Great for daily wear or any other occasion. Popular and warm enough that suitable for Spring, Autumn and Winter. The product is both hand and machine washable, or concerns, hand wash recommended. French Toast Boys' V-Neck Vest - Size: please see our size table and choose the suitable size. Knitted Solid Design. Suitable for daily wear, perfect fits as the school uniform. V-neck. Package size: 13. 8" x 11. 8". 100% cotton. Bangladesh SW-892 - Ribbed mock-neck, Cuffs and Bottom Hem. 100% acrylic. Full zipper Cardigan Sweater. Sleeveless sweater vest, easy to wear on and take off. Color: Grey/Navy. Easy to fit different type of outfit and shirt. Not amazon's size Chart Suggest one size larger! Best wear for children around 6-13 years old in spring, autumn and winter. Anti-Pilling. Pullover. Delicate setting machine wash. Sleeveless Sweater Vest. If you have any issues, questions, suggestions, please feel free to tell us so we can resolve the issue as soon as possible.100% cotton, exclusive of trims. Our classic v-neck sweater vest silhouette is knit in super soft cotton for the ultimate in comfort and style. Gioberti Boy's Knitted Half Zip 100% Cotton Sweater - Best wear in spring, autumn and winter. Machine Wash. Stand collar up or Leave Open and Lay It Down. Rib knit Cuffs and Hem. Layer over one of our incredible cotton button down shirts for the complete look! A standard pullover sweater vest from CLASSROOM is great school wear.